Well, the little guy can’t get out anymore!! 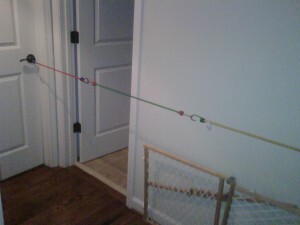 Here is the contraption that my husband set up, that attaches the doorknob of his room to another room across the hall. The little guy handled it pretty well, I think. He tested it, had a few tears, and then went to sleep! I still feel a little bit sad that he has to be locked in his room like this, but relieved that I can actually sit down and write this while my house is quiet with the wonderful silence of 3 children sleeping. 🙂 On to the next battle? YAY!!! This is so exciting…and really funny…I’m so glad it worked!